In professional sports, you'll sometimes see a star athlete who was setting all kinds of records get traded or sign with another team -- and then flop. Same athlete. Same sport. Different team, culture and fans. And very different results. Star on one team, flop on another -- even if the athlete is healthy. There are too many examples to cite but it happens every season, in every sport. And this is after scouting reports, tryouts, conversations with the athlete and their agent. And still, fairly often, there's a problem, and the player is traded away or waived. Chemistry is an important part of why a player will succeed on one team, fail on another. Chemistry is also important in client and agency relationships, a lesson I learned early on in the agency business. There must be chemistry on the agency team and with the client across the table. At Ketchum, when I was starting out, I asked then-CEO Dave Drobis what was a secret to winning new business. It comes down to chemistry, he told me: Chemistry on the agency side and chemistry across the table. The agency team needs to show that they can work together and they need to show they can work well with the client. Chemistry may even be more important than great ideas, he said, because you can have terrific ideas but be so unpleasant to work with that the client won't hire you. Chemistry isn't always about liking someone. In my second PR job, I was hired with one real goal: the EVP at the agency hated getting calls at 4:30 every Friday from a particularly unhappy client. My job: stop the client from calling to complain on Friday afternoons. I came in, figured out how to work with the day-to-day client, and we got great results: a mention on "The Tonight Show," articles in Forbes, Fortune, Businessweek, CNN, Time, Newsweek and other top national media. The client was tough and intimidating, and may not have ever truly warmed to me, but we found a way to work together. After a couple of years, she left the company, and was replaced by a much nicer, easier-going person. The problem: he wasn't a good fit in the client organization, and we couldn't get the info we needed to pitch stories. Without compelling stories the original client was about to identify through her network inside the company, there was a big drop in our results. The day-to-day client contact was the only variable that changed but it was a critical factor in our success. So what we mean by chemistry is more than likability. It can be something more elusive. Clients who pick lowest price over chemistry may do themselves a disservice. We certainly understand cashflow pressures, and we hate spending client money when we don't have to. But we learned an important from one of our clients, a biotech manufacturer who has a rule to not take on clients whose main criteria is achieving the lowest cost possible. The reason: Saving money can get in the way of accomplishing the program's goal. (Our biotech client can point to situation after situation in which penny-wise-but-pound-foolish clients, asked to cut the wrong corners, which resulted in delays and additional costs.) If everyone's eyes are on the meter, you're always looking for short cuts. Good chemistry helps when looking at the big picture. Again, when clients are focused on saving money, they keep different marketing functions operating separately. They think bringing in different vendors for regular meetings just costs money without paying off dividends. We had a client who kept the PR function separate from social media function. When it came time to make the most important product announcement for the next 24 months, we checked out the client's social media feeds only to see there was no mention of the major product upgrade. Turns out the social media team hadn't been briefed and hadn't prepared content about the new version of the company's flagship product. Reporters checking out the client's Twitter feed asked us why what we had called the company's most significant announcement wasn't even reaching their Twitter feed. Contrast that with another client who initially resisted having us talk with its webmaster but soon saw how letting us talk really benefited the client by allowing us to work together. We recently saw something that said there are three key variables: Good, Fast and Cheap but generally you can get achieve only two of those. You can have something good and fast but that's rarely cheap. You can have something cheap and fast but that's rarely good. Or cheap and good but rarely fast. Clients who prize cheap usually also want things done fast, and the result is the agency is unhappy -- because we always want to deliver something not just good but excellent -- and ultimately, so is the client. Please note: we truly understand the financial pressures of clients. We understand the need to keep budgets under control. Back in the dot-com era, working at a big PR agency, we had a couple of clients that spent crazy amounts of money, especially considering that one had no real product, no customers and no revenue. They had a PR budget of $30,000 a month, hoping that would generate eyeballs (the term of the day) but they ran out of money by the third month, owing the agency $90,000 never collected. That was a prime lesson for taking a different approach at Birnbach Communications to our clients -- they all had to real products, real customers and real revenue or funding. There's a balance between spending not enough money and spending too much. We're not trying to blame clients who need to be conservative with their budgets; we just have learned to walk away when clients ask us to reduce the hours and fees in our proposal, based on our experience of how much time a project will take -- because they often don't reduce their expectations. That affects and degrades the chemistry and trust. So good chemistry is elusive. In some cases, chemistry is really a matter of trust across the table. There are steps we take to develop the chemistry and to build the trust and invest in the client relationship. When you have it, the agency team and client team can achieve success together. In our previous blog, "5 Factors That Make It Harder to Break Into National Business Media," we discussed some of the challenges to getting ink in the national business media. In this article, we will talk about three tips to successfully getting the media's attention. Understand the mission of the media outlet you're pitching. Forbes, Fortune and Bloomberg Businessweek may seem similar but they are very different. Forbes is interested in investing opportunities and providing contrarian perspectives. Fortune is interested in management (as opposed to investing though it does publish investing-specific issues) and Bloomberg Businessweek provides more of a news snapshot of the world as it affects business. Pitching a Bloomberg reporter on a company as an investment opportunity won't work -- just as you have to expect a Forbes reporter to ask about a company's valuation even if that's not directly relevant to the story. Study the sections and opportunities that each media outlet offers. Each newspaper, magazine and website has different sections and columns. And each section or column offers a different path into coverage. For example, the Wall St. Journal has sections for Chief Information Officers and another for Chief Marketing Officers. There could be a way to tell a client's story through the eyes of its CIO that might be very different from the CMO's. There's a Journal columnist who handles work-and-family issues, and your client may have a story there. Fast Company has a section in which executives can offer something -- an app, a book, etc. -- that they highly recommend. And various publications offer a look at an executive's interesting office. We look at all those sections for ways to get our clients considered. Get to know the reporters and how they approach their articles. Too often publicists, who are juggling many tasks, pitch based on media lists assembled by a database. These databases are helpful in tracking down contact info and background. But they are often not-quite-accurate. Reporters move around a lot these days, so we've seen a Washington Post reporter still listed as working for the Wall St. Journal -- six months after she joined the Post. We've seen reporters listed as covering one topic when they shifted beats. And sometimes the coverage details are broad enough to not be useful. It's important to learn what reporters cover and how they cover it. A reporter will cover news differently from a columnist. It's not enough to respond to a single story; too often it might be a one-off story that's not relevant to the reporter's regular coverage. We look at several weeks' worth of coverage and what they post on social media to get a sense of their approach and interest before we pitch. And then we look at the elements that are frequently included in their articles so that we can make sure to offer up those elements, too. Look for alternative ways in. For one client, we played up the CEO's racecar-driving hobby to secure local coverage, and we got a good response from a Forbes editor who shares racecar driving as a hobby (though that did not lead directly to coverage). That's something we ask of new client teams. For another client, we recommended the CEO post comments to articles published online by the company's key trade magazine as a way to engage with its community. In one case, the publication contacted him to ask if he would give permission to use his comment as a letter to the editor. Of he said yes, and we got a double hit in the print edition. Be creative get the reporter's attention. Look, this is from a while ago but a former colleague recently posted about this on LinkedIn, and it brought back memories. 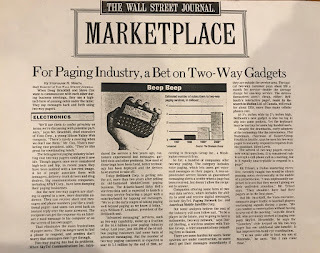 On behalf of RIM, we were trying to get attention of then BusinessWeek tech columnist, Stephen Wildstrom, to review a new product: The BlackBerry pager that offered email; one of the first portable email device available at the time. The question was: how to get Wildstrom's attention for a then-unknown startup launching a new product to compete against the Goliath of the day, Palm as it prepared to launch its Palm VII. My solution: I emailed WIldstrom several times during my commute home, always pointing out that I was emailing him while on the MBTA. 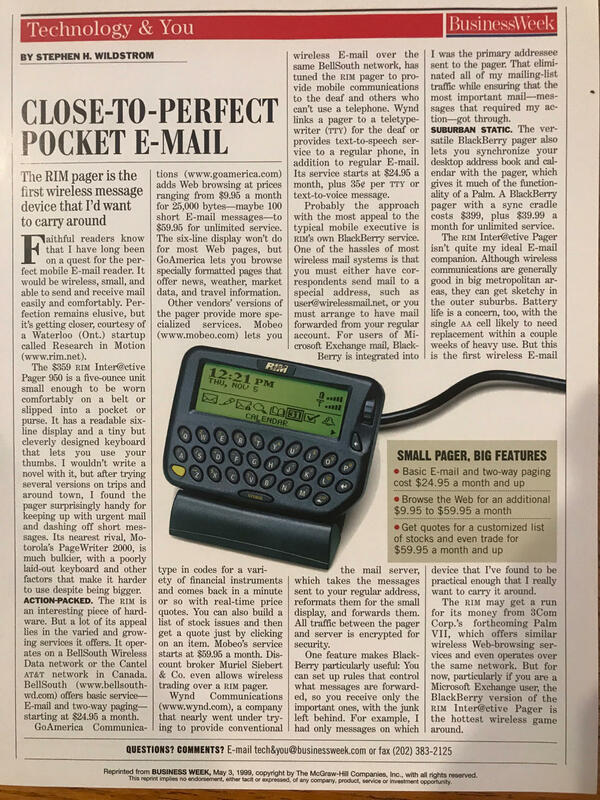 After a couple of those commuting-time emails, WIldstrom requested review copies of the pager. 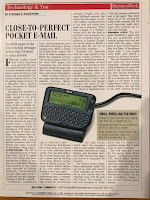 The result: a terrific headline: "Close to Perfect Pocket E-Mail." 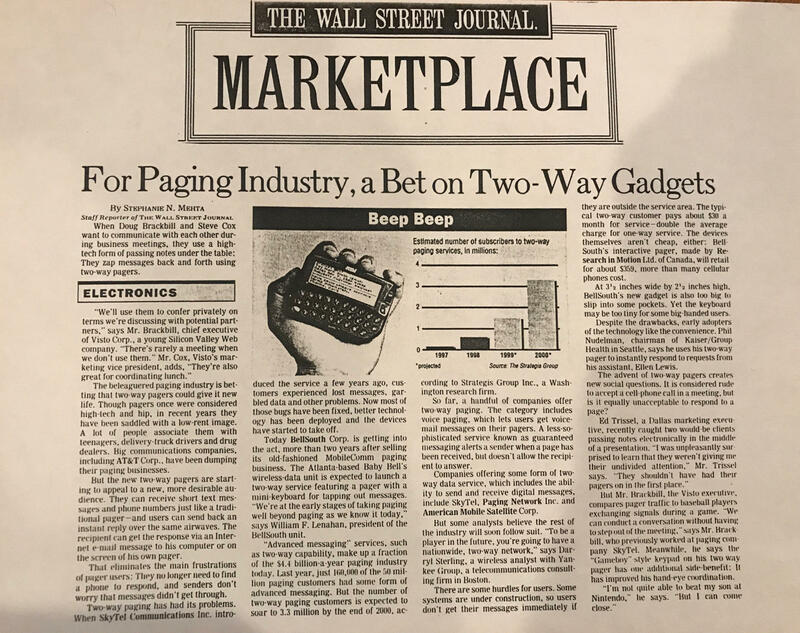 For Stephanie Mehta, then a Journal reporter (who then went to Forbes and is now the editor at Fast Company) we pitched a story about the sector based on BlackBerry: "For Paging Industry, a Bet on Two-Way Gadgets." Make sure the pitch is relevant to the readers. This might seem obvious but sometimes agencies and their clients forget about this. They're excited to pitch good news about the client that they forget that the news may not, by itself, interest readers. A Fortune reporter once said, "That's good news for your client but for readers who don't follow your client or their sector, there's not much of a reason for them to stop and read my article about them." So we always look for how our clients' news fits in to what the reporter and his/her readers or viewers are interested in. What do the readers (or viewers) want or need to know? Another question we ask: why should the reporter or reader care about this story now (as opposed to six months from now)? Leverage interest in timely news via "newsjacking." Newsjacking is a term that means taking advantage of a current events or news to communicate your brand's message or your subject-matter expertise. Most news events are probably not appropriate so you have to look for a natural connection, and move quickly. For one adoption nonprofit, during the Ebola crisis we advised their PR consultant on pitching the media to help tell how the charity was helping to get children out of infected areas. Another way to newsjack goes back to the BlackBerry days: we contacted reporters we were sure to cover the Palm VII launch with a detailed fact sheet that compared the BlackBerry to the known features of the pre-launch Palm VII. More recently, we did something similar for a startup client's digital compression technology ahead of a soon-to-launched competitive solution from a much-larger company. In most cases, what you want to do is become a resource for reporters, to be someone who can provide reliable insight into a situation. Think like a reporter. We look at clients and the stories they tell, and try to think like a reporter would, if encountering the client for the first time. It means taking an objective look at the organization, and asking, "Is this a story? Or is it a blog post?" Blog posts are valuable; they can help with SEO and drive traffic to your website to find out more about what you do. As a reporter, you're looking for something that will engage people outside the company, that tells a story readers didn't know, provides insight into something relevant to the consumers of that media outlet. That also means thinking through what a reporter will need to tell a compelling story -- what are the elements. For example, when pitching an NPR reporter, keep in mind they like natural sound so you need to give the reporter a sense if they can capture interesting/unusual sounds. Once you think like a reporter, you'll be better able to develop and pitch them a story that will work for them -- and you. Let us know if you have any questions about these tips. Or let us know if we left out one of your favorite tips.